What is the purpose of the ADAPTS platform? ADAPTS establishes a portal for public exploration of the crop diversity maintained in the Native Seeds/SEARCH seed bank. The NS/S collection holds approximately 1,900 accessions (see below) of agricultural crops and crop wild relatives from the Greater Southwest region, i.e., the southwestern United States and northwestern Mexico. The collection represents a legacy of over 4,000 years of continuous agriculture by the Native peoples of this arid region and by later arrivals. In a time of climate change, depleting resources and population growth, crop varieties that are better able to withstand heat and drought, marginal farming environments, and low-input agricultural practices hold an important key to resilient and sustainable food systems in the Southwest and beyond. Our hope is that ADAPTS will facilitate increased exploration and use of this crop diversity by enhancing the ability of farmers and gardeners to learn about the crops and to access seeds. What is an "accession" and how is it different from a "variety"? One of the most important concepts in seed banking is the accession. Within a seed bank collection, an accession is a distinct population of seeds that is maintained in genetic isolation from other such populations. In the NS/S seed bank, most accessions represent a single acquisition of seeds of a specific crop landrace from a single farmer at a particular time and place, plus the descendents of that initial sample of seeds. In the process of ex situ conservation, the genetic identity and diversity of each accession are sustained as much as logistically possible. Through careful propagation, pollination and seed storage methods, each accession is maintained as a distinct entity and evolutionary change is minimized. For example, cross-pollination between two accessions would cause them to no longer be genetically isolated from one another and is prevented through crop-specific techniques. A variety or cultivar, on the other hand, is a looser categorization that refers to crops that have a particular set of characteristics. To better understand the difference, consider the case of the Tarahumara Ojo de Cabra bean in the NS/S collection. 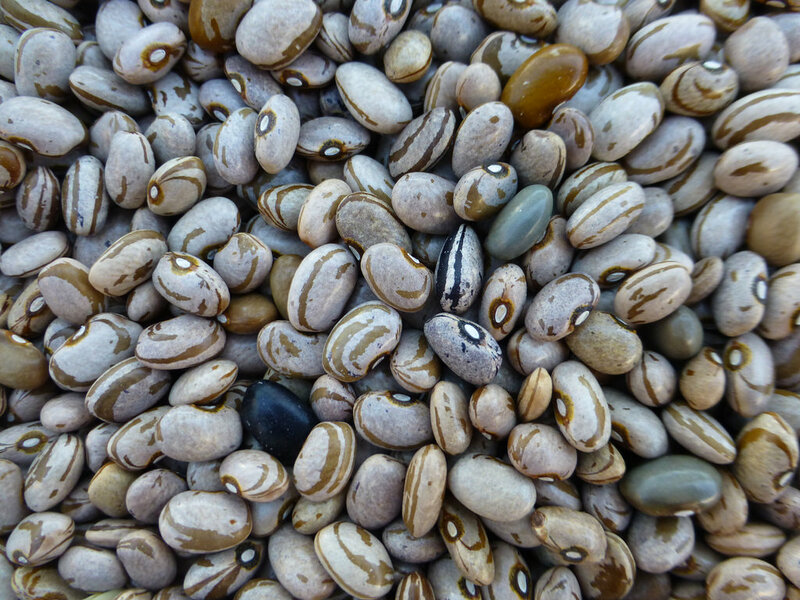 Tarahumara Ojo de Cabra refers to the name of the variety (as given to it by NS/S; the Tarahumara, or Rarámuri, have their own name for these beans) and reflects both cultural dimensions and the physical traits of the beans themselves. The NS/S collection contains nearly twenty accessions of Tarahumara Ojo de Cabra beans, which display the characteristics that define them as this variety but also show genetic diversity within and among themselves. In some cases, an accession may be "mixed" and contain representatives of more than one variety. This is a frequent occurrance in landrace varieties and is common in the NS/S collection. How do I use the Search page? The Search page provides the primary route to explore the diversity within the NS/S seed bank collection. Over twenty different search fields are provided, and these can be used in any possible combination to help you narrow in on the accessions that are of greatest relevance to you. For example, you may be interested in all watermelon accessions that were collected in Arizona at altitudes above 4,000 ft. and for which seeds are currently available for distribution from NS/S. In this case you would fill out the Crop Type or Genus field, the State field, the appropriate Elevation field, and check the "Only Return Varieties that are Currently Available for Distribution" option. At any point you may return to the Search page and revise your search by adding, removing or changing the values in the search fields. To see all accessions in the collection, simply leave all fields blank and run the search. One of the most interesting types of searches involves use of a user-defined reference location. This is a geographic locality that you, the user, specifies on the Search page. It may be a street address, the name of a city (though it is best to also specify a state if the city alone might be ambiguous), or coordinates of the form "latitude, longitude". You can search for accessions that were collected from with a certain horizontal (miles) or vertical (ft.) distance of your reference location, or within a certain number of degrees of latitude north and south. You can also rank accessions by how climatically similar their collection localities are to your reference location. How are climate similarities calculated? Among the most important functions provided by ADAPTS is the comparison of climatic data between accessions and user-defined locations. This feature enables food producers to identify the crop varieties in the NS/S collection that are most likely to be best adapted to their local conditions (though see the next question below for some important caveats). To develop this functionality we adapted the Climate Analogues approach of the CGIAR Climate Change, Agriculture and Food Security research program. Essentially, this process compares monthly climatic variables between the two sites and derives a similarity score for the two climates. Lower scores indicate greater similarity, and accessions can be ranked from greatest to least similarity to the reference location. To make the comparisons computationally tractable, climate data are analyzed in geographic grids of varying size. For the Greater Southwest, these grids are approximately 0.5° wide in both latitude and longitude (the absolute grid size varies with latitude but is roughly 30 mi by 40 mi at the latitude of Tucson, Arizona). Beyond the Southwest, data are provided at somewhat lower resolution (grid sizes of about 1.5° latitude and 2.5° longitude) for the contiguous United States, all of Mexico, and Central America and the Caribbean as far south as the southern tip of Honduras. Because air temperature changes fairly predictably with altitude, we adjust the modeled temperature data for both the accession and reference sites at a rate of 6.49 °C per 1,000 m in elevation. How seriously should I take the climate comparisons? The precision of the climate grids is fairly low, and this means that in areas with a lot of topological variation (which describes most of the Southwest) the average climate modeled for a given grid is not likely to be highly accurate for any given location within that grid. We make altitude-based adjustments to the temperature data, but this is only a partial fix to the problem. In the future we hope to provide greater geographic coverage and precision with the climate data. ADAPTS currently uses data modeled from historical climate data (averaged over 1961-1990) to calculate climate similarities. These data therefore do not account for the effects of climate change. In the future we plan to incorporate climate change models to enable comparisons based on current and future climates. The climate comparison tool currently doesn't allow you to focus on only certain climate variables or seasons. For instance, you may be interested only in rainfall and high temperatures during the summer growing season. Such fine-tuned comparisons are not currently possible in ADAPTS, but will be made available eventually. The climate data used by ADAPTS may not always be reliable. For instance, we have observed that the modeled estimates of summer precipitation in the southwestern U.S. do not seem to properly account for the important effects of the monsoon. Low temperature estimates also sometimes seem unreliable. In a future version of ADAPTS we plan to use a dataset that is more reliable for the Southwest region. The collection locality for an accession may not represent the environment in which it developed its characteristics. For example, NS/S may have acquired its original seed sample from someone who recently migrated to a new region and brought their seeds with them; the seeds, then, will have only existed in their current location for a short time. An underlying assumption is that crop accessions are well-adapted to the locations from which they were collected. This is likely to be true in some cases (though we don't have good data on this), but in many cases a local crop landrace may not be especially better adapted to conditions in its traditional locality than varieties from elsewhere. The evolutionary process of adaptation is the result of natural selection, but crop populations may experience repeated genetic bottlenecks and severe genetic drift, which can reduce the strength of selection. Farmers may also select for particular traits of interest for cultural reasons, and these traits are not always adaptive in the sense of maximizing crop yields (though they are still exceptionally valuable). As a corollary to the previous point, another assumption is that crops are not well-adapted to locations outside their site of origin. This is also likely to be incorrect in many or most cases (again, we lack robust data to say with certainty at this point). The breadth of crop tolerances to climates, soils, diseases and pests varies substantially from variety to variety. While some accessions probably will only perform well in a narrow set of circumstances, many others are likely to be quite flexible. This is especially true given the high genetic diversity found in many landrace varieties, which should enable them to respond favorably to a range of conditions. We are currently building new features for a future version of ADAPTS that will enable us to crowd-source observations of crop performance from growers and build an understanding of how different varieties respond to different environments. In sum, we encourage you to use the ADAPTS climate functionality to explore the diversity in the NS/S collection. Generally speaking, it will provide important insights into the rough climate adaptations of a given accession. But use it only as a rough guideline: don't assume that a variety will grow well for you even if it comes from a location with a very similar climate, and don't assume that one from a very different climate will not perform well for you! You may have good success, for example, with varieties that are from hotter, drier or lower-elevation localities than yours. Don't be afraid to experiment, and let us know how you do! What types of information are provided for each accession? ADAPTS presents taxonomic information about the accession, cultural affiliation, current availability of seeds, geographic information about the original collection locality, climate data for the collection site, available photos of the accession, and observations about the accessions's traits. See the screenshots below for examples. Who owns the seeds in the NS/S collection, and are there any restrictions on how I can use the seeds? Native Seeds/SEARCH honors the people, communities and cultures that developed and maintained the rich agricultural biodiversity that the Greater Southwest now hosts and that NS/S now stewards in its seed bank. We are committed to protecting the privacy of these individuals and communities and their right to full access to the seeds traditional to their cultures, in perpetuity. NS/S also believes that agricultural diversity should be widely available as a shared resource of humanity. For this reason we oppose attempts to exert exclusive ownership over crop genetics and to restrict public access to crop diversity. We encourage examination of the material in the NS/S collection by researchers but require that a formal Material Transfer Agreement be signed by both parties before transfer of seeds from NS/S. To protect future facilited access to the seeds, we will not share seeds if they are to be used in a breeding program or other activity with a patent outcome. Please contact us for details. How can I get seeds of crops that I'm interested in? Native Seeds/SEARCH distributes seeds from its collection through several venues. Native American individuals may be eligible for a limited number of seed packets at no cost through our Native American Free Seed Program. Community-based organizations in the Southwest may apply for free seeds through a Community Seed Grant. Farmers interested in growing large quantities of a given variety may inquire about our Bulk Seed Exchange program. Researchers should contact us directly regarding their interest in obtaining seeds for research purposes. For normal purchase of seed packets of available varieties, please visit our online store or retail store; some varieties that are in low supply may only be available to Native Seeds/SEARCH members or Native American Free Seed recipients. Seeds are sold roughly at cost as a public service and help sustain our non-profit conservation activities. Native Seeds/SEARCH sells seeds of varieties, e.g., Lacinato Kale, that I can't find in ADAPTS. Where are they? Native Seeds/SEARCH complements its collection of Southwest-derived crop biodiversity with distribution of a limited number of varieties that are not traditional to the region. These varieties are indicated by catalog numbers that start with "TS", for example TS107 (Lacinato Kale). NS/S distributes them because they fill gaps in the species-level crop diversity contained in our own collection; while they lack a long history of cultivation in the Southwest, they can nonetheless contribute meaningfully to the region's food systems. However, on a practical level these varieties are not formally part of the NS/S seed bank collection and are not incorporated into the organization's standard conservation activities. In the future we hope to expand ADAPTS to include such "extra-regional diversity". Can I use photos from ADAPTS for my own purposes? All photographs on this site are copyright Native Seeds/SEARCH, all rights reserved, unless otherwise indicated. We encourage use of the photos for non-commercial purposes but require that a formal request be made, explaining the purpose to which the photos will be put. We also request that acknowledgment of Native Seeds/SEARCH be made when the photos are used. What other features are planned for ADAPTS in the future? The ability for users to enter their own observations of crop characteristics or performance on an accession-by-accession basis. We will thereby be able to crowd-source the broad documentation of the agricultural biodiversity in the NS/S collection across a broader range of climates and growing conditions than we could attempt on our own. Improved climate modeling by incorporation of climate change models, greater precision and accuracy of the underlying climate data, and the ability for users to search on climate parameters and seasons of interest. The ability to search on crop traits, for example plant height, growth habit, etc. The ability to export search results and accession-level data. A forum capability to encourage public discussion of the crops and related topics. Who funded the development of ADAPTS? Initial and principal development of the ADAPTS platform was funded by a generous grant to Native Seeds/SEARCH by the Gila River Indian Community. Additional development is being partially funded by grant awards from the Southwestern Foundation for Education and Historic Preservation. If you have questions about the ADAPTS platform that aren't addressed by this FAQ, please contact us.